Obituary – Carrier, C. Wayne « Perry High School Alumni Association, Inc.
﻿F. F. A. 47-51, F. F. A. Treasurer 49-50, F. F. A. President 50-51, Baseball 49-51. ﻿C. Wayne Carrier, a loving husband, father, grandfather and friend died June 26, 2008 at Mercy Hospital in OKC due to complications from surgery. He was born August 29, 1933 in Perry, OK to Arthur & Ethel Carrier. He attended White Grade School and later graduated from Perry High in 1951. 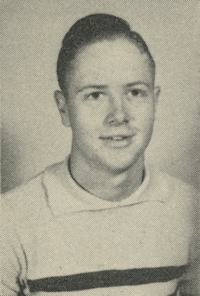 He served in the U.S. Army 1954-1956 and went on to graduate from OSU in 1960. He worked for Central Exploration, Sinclair/Atlantic Richfield, Union Oil Co. of California, and Amarex 1960-1986, and worked as an independent consultant 1986-1991. In 1991 he joined his wife in Real Estate sales with Prudential Realtors. Wayne held several’ offices in Oklahoma Geophysical Society including President, served as President of the Surrey Hills Lions Club, and was actively involved in the community. Wayne was a member of the Church of the Servant & TLC Sunday school class. He is preceded in death by his parents, and a son-in-law Stan Terry. Wayne is survived by his wife, Roberta Carrier; son, Tony Carrier & wife Lynn of Surey Hills; two daughters, Lana Little & husband Alan of Oklahoma City, and Tina Brewer & husband Wright of Dallas, TX; seven grandchildren, Miles Terry, Morgan, Taylor & Quade Brewer, Ali Hinkle, Kelsey & Matt Little; brother, A. Burl Carrier & wife Rena from Stillwater, OK.
A funeral service is scheduled for 10 AM Monday, June 30, 2008 at Church of the Servant, 14343 N. MacArthur Blvd. OKC, with burial to follow at Resurrection Memorial Cemetery. In lieu of flowers, contributions may be made to Church of the Servant in Wayne’s honor.